Desire2Learn of Kitchener, Ont. is finally learning how it feels to say yes to a venture capital deal. After turning down various VC offers, the company has raised a huge chunk of change for its first ever venture capital deal – $80 million, to be exact. The VC is courtesy of OMERS Ventures and U.S.-based New EnterpriseAssociates. The latter has an impressive portfolio of startupinvestments that includes Box, Evernote and Groupon. As noted in oursource article from the Globeand Mail, Desire2Learn‘s e-learningsoftware platform is used by organizations such as the Ontario Ministryof Education, the New York City Department of Education anduniversities in Canada, China and Singapore. 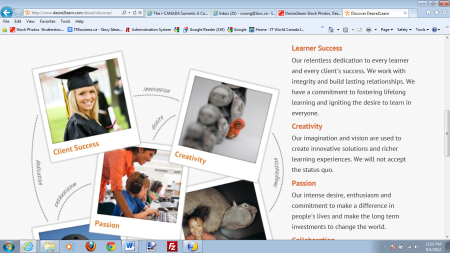 Screen shot from Desire2Learn’sWeb site. Desire2Learn told the Globeit will use the cash to boost itsR&D and sales efforts. Why did the company resist repeatedoffers from venture capitalists forso long? “We’ve seen too many companies come and go. And we wanted to make surewe built a relationship with two partners that believed in our visionfor transforming learning,” president and CEO John Baker told theGlobe‘s IanMarlow. Desire2Learn has done just fine without any VC support so far, adding233 employees this year to bring its total staff to about 560, theGlobe says.It also plans to open a new 15,000-sq.ft. office in Torontosoon. Desire2Learn isn’t the only non-VC success story. UK startup GrappleMobile turned down $10 million in VC funding in 2010 but has sincegrown into a firm with 85 staff in the UK, U.S. and Canada and clientssuch as McDonald’s, IBM and Adidas. In a BusinessInsider interview,Grapple Mobile co-founder Alistair Crane explained why his firm turnedaway the venture capitalists.